Tracking your order or has my order shipped? Please call our customer support department at 877-850-2662 or e-mail support@rubberexpansionjoint.com for tracking information. All orders placed before 3:00pm EST will be shipped the same day they are received. If you have a backordered item customer support will e-mail or call you to advise the status of your backorder. If your order is less than 200 LBS it will ship out UPS small package. Please click the attached PDF for UPS Ground time-in-transit map. 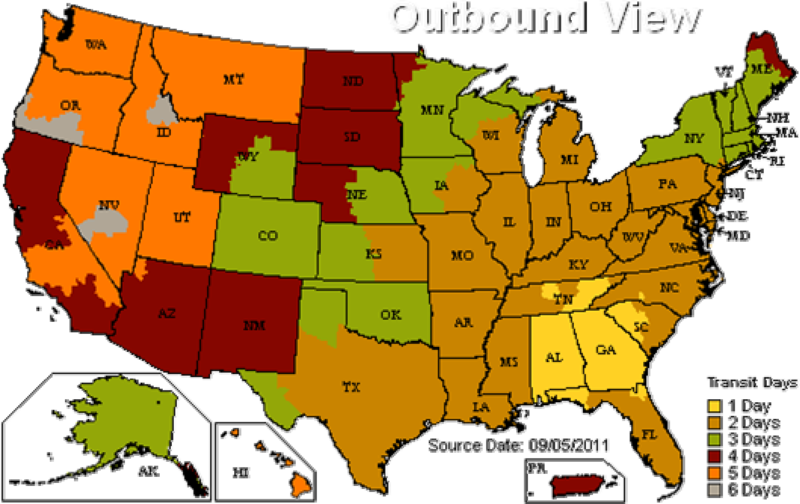 If your order is over 200 LBS it will be shipped out via UPS Freight. 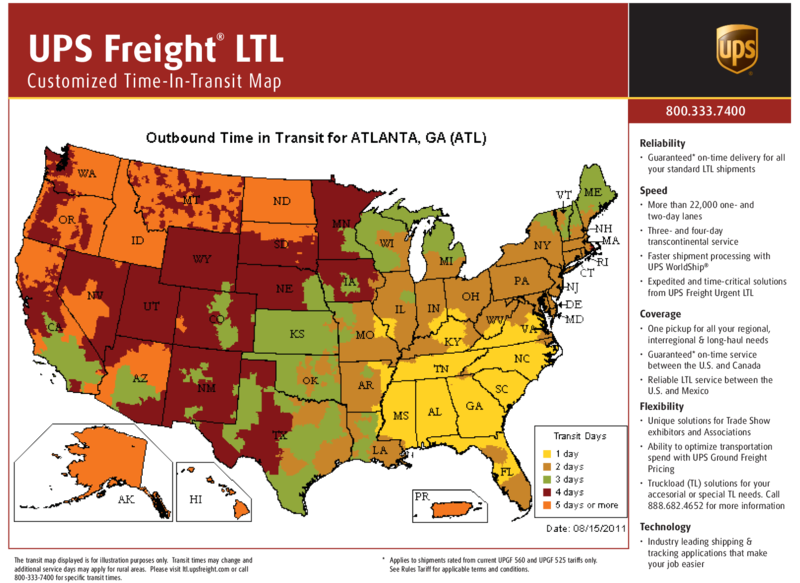 Please click the attached PDF for UPS Freight time-in-transit map. Please call our customer support department at 877-850-2662 or e-mail support@rubberexpansionjoint.com with all of the specific parameters of the custom rubber expansion joint. We can provide any rubber joint. Custom joints once ordered are not returnable. Before you go to the trouble of sending the product back to us, please call our customer support department at 877-850-2662. We won’t try to talk you out of making the return and we promise to make the process as easy, convenient and inexpensive for you as we possibly can. Our Expert Staff members are available from 9:00am to 5:00pm ET Monday through Friday, except for holidays. If you prefer, you can e-mail your questions or concerns to support@rubberexpansionjoint.com. Is Something Missing, Damaged, Or Defective? If something is damaged, please save the box and all packing materials and call us immediately. Please inspect your order as soon as it arrives. If something is missing, damaged, or defective, please call our Expert Customer Support Department at 877-850-2662 Mon-Fri 9:00am-5:00pm Eastern Time. We will take care of the problem at our expense with the least possible inconvenience for you. In an instance when we do not have an item in stock, it will be indicated on the invoice (under the B/O column) and shipped as soon as possible with no additional shipping charge. Unfortunately we cannot take back any used items or items put into service or attempted to put into service. Is There Something You Want To Return Or Exchange? www.rubberexpansionjoint.com has a 30 day return/exchange policy on unused items in the original box. Please call our customer support department at 877-850-2662. We won’t try to talk you out of making the return and we promise to make the process as easy, convenient and inexpensive for you as we possibly can. The shipping cost is the responsibility of the customer on returns and exchanges both ways. Refunds will be issued to the same credit card that was used to purchase the item(s) returned. It has been over 30 days and I need to return or exchange an item. You can return or exchange your item(s) up to 180 days from date of purchase. If you bought your item over 30 days from the date of the original order you will be charged a 25% restocking fee. Shipping charges for your original order or for the return are not refundable. Refunds will be issued to the same credit card that was used to purchase the item(s) returned. www.rubberexpansionjoint.com carries a $5,000,000 product liability insurance policy. If you need a copy of the policy please call our customer support department at 877-850-2662 or e-mail support@rubberexpansionjoint.com.